Note: The SCCM 1902 Current Branch media is not yet available on MSDN or VLSC. When the new baseline media is released I'll update this note. I will show you how to do most steps via two methods shown below, it's up to yo﻿u to choose which method suits you best but I highly recommend automating everything that you can, using PowerShell. To join the domain manually, login to CM01. Start Windows File Explorer. Right-click on This-PC and choose Properties. The System screen will appear. ﻿ Cli﻿ck on Change settings to the right of Computer name. 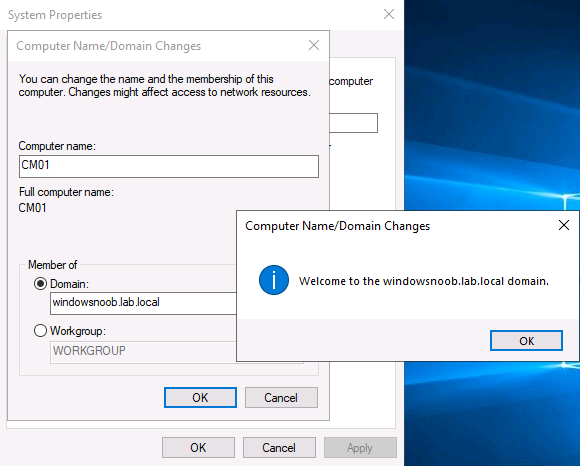 For the option To rename this computer or change its domain or workgroup, click Change, click Change and for Member of select Domain, enter the Domain details used in Part 1 of this series and then click﻿ OK.
and enter domain join credentials as appropriate when prompted. Once done you'll get notification that you've joined the domain. 3. Start Windows PowerShell ISE as Administrator and run the script by clicking on the green triangle﻿. and click Finish when done. 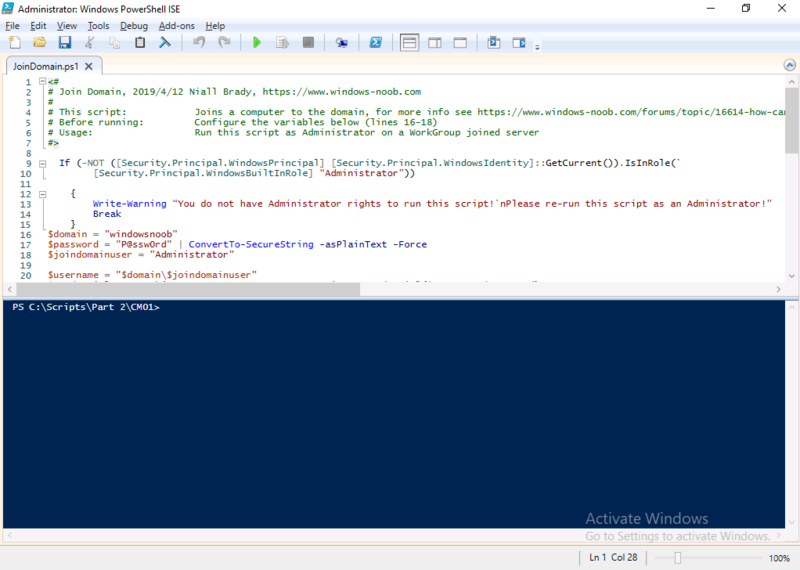 Note: The PowerShell script creates users and in addition makes a user a local admin on the CM01 server. To facilitate the local administrator creation, you'll need to (optionally) create a GPO manually on AD01 called Allow Inbound File and Printer sharing exception which sets Windows Firewall: Allow inbound file and printer sharing exception to Enabled. To Create the GPO on AD01, click the Start menu and choose Windows Administrative Tools, then select Group Policy Management. Expand Group Policy Objects and Right click, choose New and give it a Name: Allow Inbound File and Printer Sharing Exception. 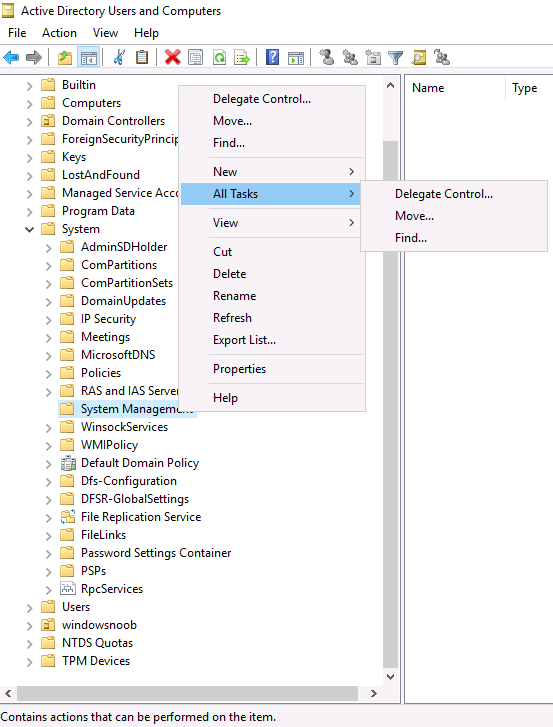 In the GPO settings, expand Computer Configuration, Policies, Administrative Templates, then select Network, Network Connections, Windows Defender Firewall and select the Domain Profile. Locate the Windows Defender Firewall: Allow inbound file and printer sharing exception and set it to Enabled. Apply the changes. Next, click on the Add button, for Select this object type make sure to select Computers from the Object Types and select the group or Computer object (eg: CM01$) that you want to have this policy apply to. Then select the group (e.g. ConfigMgr Servers) and scroll the permission list until you see the Apply group policy option and then tick the Allow permission. Finally, you need to Link the GPO, to do that, right click on your Domain (in this example it's windowsnoob.lab.local) and select Link an existing GPO. 1. Copy the script to C:\scripts on AD01, see the notes above about the GPO creation. as the value then click Next and then c﻿lick Finish. The System Management container is created. 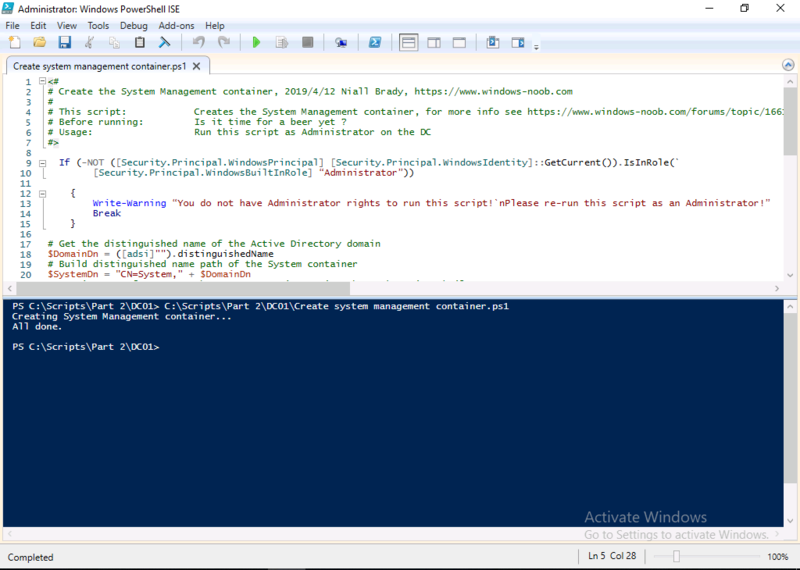 To join the domain automatically, use the Create system management container.ps1 PowerShell script. Open Active Directory Users and Computers. Click on view, select Advanced Features. Select the System Management Container under System. Right click the System Management container that you just created, choose All Tasks and Delegate Control. When the Welcome to Delegation of Control Wizard appears click next, then click Add. click on Object Types, select Computers. 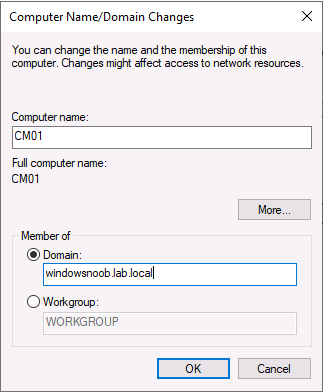 Type in your Configuration Manager server name (CM01) and click on Check Names, it should resolve. 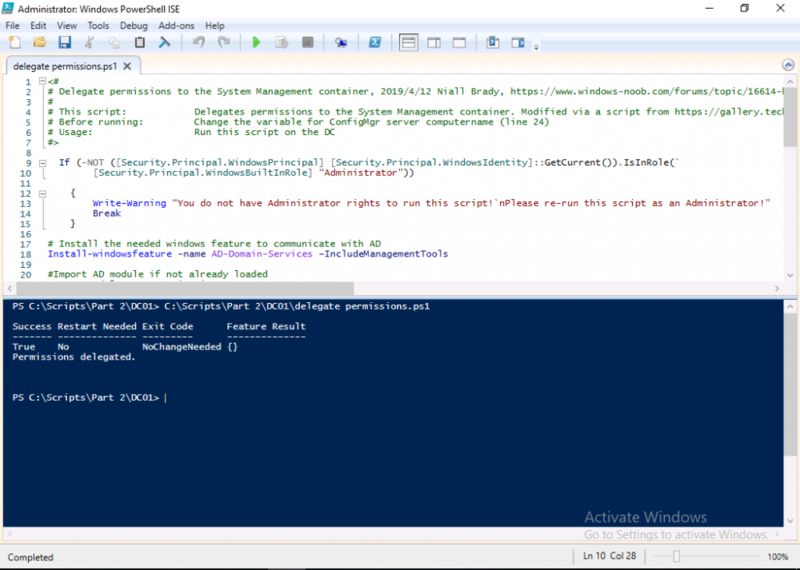 Click Ok.
To join the domain automatically, use the Delegate Permissions.ps1 PowerShell script. That's it for this part, please join me in Part 3 where we'll configure the ConfigMgr server with Roles and Features and get Windows ADK and WDS setup.